Lightweight, strong and long-lasting. Aluminium is a very light metal with a specific weight of 27 g/cm3, about a third that of steel. Its strength can be adapted to the application required by modifying the composition of its alloys. Highly corrosion resistant. Aluminium naturally generates a protective oxide coating and is highly corrosion resistant. Different types of surface treatment can further improve this property. It is particularly useful for products where protection and conservation are required. Excellent heat and electricity conductor. Aluminium is an excellent heat and electricity conductor and in relation to its weight is almost twice as good a conductor as copper. Good reflective properties. Aluminium is a good reflector of visible light as well as heat and that, together with its low weight, makes it an ideal material for reflectors in, for example, light fittings or rescue blankets. Very ductile. Aluminium is ductile and has a low melting point and density. Completely impermeable and odourless. Aluminium, even when it is rolled to only 0.007 mm thickness, is still completely impermeable and lets neither light, aroma, nor taste substances transfer. Infinitely recyclable. Aluminium can be recycled again and again without loss of quality. The re-melting of aluminium requires little energy; it saves up to 95% of the energy required for primary aluminium production. Aesthetically pleasing. Versatile in its ability to accept different surface finishes, for example, anodising and powder coating. Aluminium is produced through two different routes: Primary Aluminium from bauxite ore and Recycled Aluminium from processed scrap and used aluminium products. Bauxite ore is in abundant supply, occurring mainly in tropical and sub-tropical areas such as West Africa, South America and Australia. Once mined and refined it can then be rolled, cast or extruded into anything from architectural structures to aircraft, cars and packaging. After use it can be recycled repeatedly without loss of its material qualities. 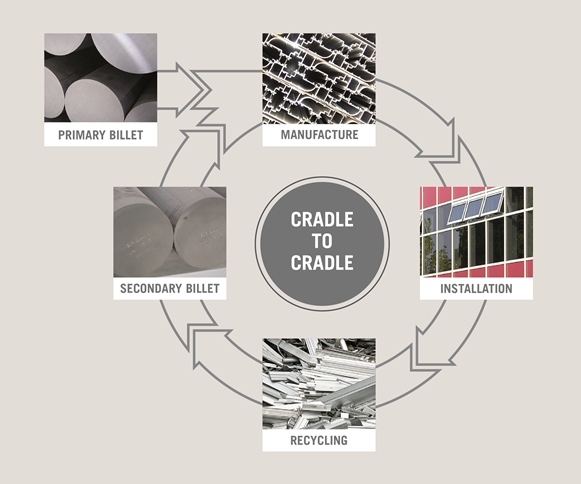 This property of infinite recyclability means that up to 75% of the world’s aluminium ever produced is still in productive use, having been through countless loops of its ‘cradle to cradle’ lifecycle. Given that it only takes 5% of the original energy used to create primary aluminium, recycled aluminium is a true eco-friendly material that can be made available not just once but indefinitely for future generations. Therefore Aluminium offers a building material that is sustainable and effectively inexhaustible.